Have you ever had a video file that just took up way too much space? One that you wanted to show to your friends, but would never fit as an email attachment? While there are many programs out there that offer to merge multiple clips together, there are few that do the opposite. Thankfully, you only need one - and that would be today's discount software promotion, Boilsoft Video Splitter! 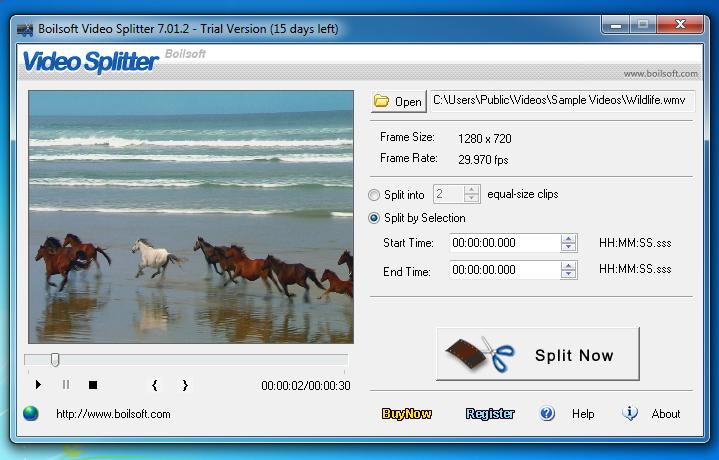 Boilsoft Video Splitter lets you split, cut, and trim large video files into smaller clips, all without re-encoding. With Boilsoft Video Splitter, you'll enjoy support for a wide range of video file formats, including AVI, MPEG, RM, ASF, WMV, 3GP, MKV, FLV, and MP4, plus an integrated video player that lets you see the results of your work without leaving the program. You'll be stunned by the results you can achieve with Boilsoft Video Splitter, gaining multiple smaller segments without any compromise in quality. Even if you start with one video file format, Boilsoft Video Splitter lets you finish with another. That's right, with Boilsoft Video Splitter you have the choice of outputting your segments in any file format that you like, including 3GP, AVI, DVD, FLV, iPod, MP3, MP4, MPEG, PSP, RM, SVCD, VCD, VOB and WMV. You even have your choice of extracting video segments by start and end time, or just splitting the file into multiple segments of equal length. It's all in your hands with Boilsoft Video Splitter. After you purchase Boilsoft Video Splitter it may be used indefinitely. Boilsoft Video Splitter is licensed per user, so if more people are going to use Boilsoft Video Splitter you will need to purchase additional copies. You must install/register the software within 7 days, and cannot do so afterwards. Constantin Florea I've sent the receipt emails to all of you requesting this above. D0tted I haven't received registration code either. I kept asking it to resend but I would never receive it. Constantin Florea, could you please send me mine too? Constantin Florea @D0tted, I just resent you the receipt email. D0tted Thank-you for the fast reply! John Wei @Ricky M, please check your email. Tiberius I just installed it and it won't take my key. When I put the email address for the name it says that the key is not correct. When I input my name it tells me to restart the program. When I restart the program it is still in the trial mode. Constantin Florea @Tiberius, I looked at your purchases page and noticed that you did participate in a giveaway we had in 2014 for this product. If you are trying to use the key from that receipt to register the product, it won't work because the giveaway keys for products from this vendor are usually valid for 15 days from the promotion date. This is not the same key. I was another computer that has been upgraded to W10. I lost the program that way, I guess. I received a new key from this 65% off offer. Tiberius The weekend has passed and it's Tuesday night here. I wrote 2 messages to them on the weekend and just sent another one. Is there another way to contact them? The program still insists on staying in the trial mode after I insert my new key. John Wei @Tiberius, sorry, we have replied you, please check your email. Lonny User I will never buy software that it is not allowed to transfer to another computer, I am person with not much money &buy cheap computers so a crash could happen anytime.